Several thousand tons of waste fishing gear is discarded in the ocean each year. It's not biodegradable and remains in the environment catching and killing marine wildlife until someone intervenes. 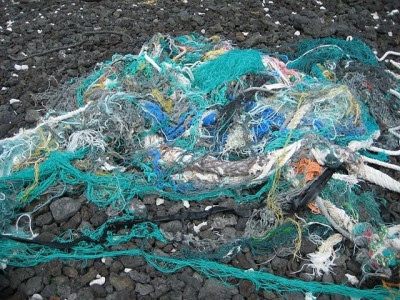 Approximately 640,000 tonnes (710,000 tons) of fishing net is lost or discarded in the ocean each year, which constitutes one-tenth of all marine litter. It is not biodegradable so remains in the marine ecosystem until manually removed, capturing and killing marine animals in the meantime. This is known as ghost fishing, and ghost gear is often found on reefs and shipwrecks which are essential habitats for their high biodiversity. 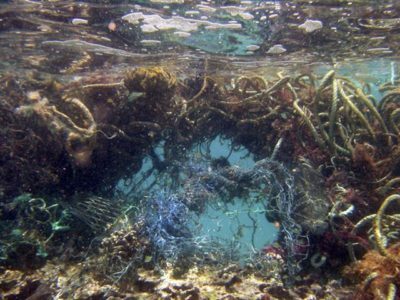 Once lost or discarded, a net may become caught on a reef where it will smother coral, kill fish and attract scavengers, who also end up trapped. Alternatively, a ghost net may drift to open water where it will begin fishing. The net will eventually become weighed down with dead wildlife and sink to the seafloor. As the bodies decompose and get eaten by scavengers, the net gets lighter, rises, and starts fishing again. That is unless we remove it from the ecosystem. A number of organisations are already working to remove ghost gear and dispose of it responsibly while also educating fisherman on the severe impacts of discarding nets. You can help them break the ghost fishing cycle by acting now.